Anxiety is something we all experience from time to time. Most people can relate to feeling tense, uncertain and, perhaps, fearful at the thought of sitting an exam, going to hospital, attending an interview or starting a job. Anxiety attack is an exaggeration of the body’s normal response to fear, stress or excitement. It is the rapid build-up of overwhelming sensations, such as a pounding heartbeat, feeling faint, sweating, nausea, chest pains, breathing discomfort, feelings of losing control, shaky limbs and legs turning to jelly. If you experience this, you may fear that you are going mad, blacking out, or having a heart attack. You may be convinced you are going to die in the course of the attack – making this a terrifying experience. 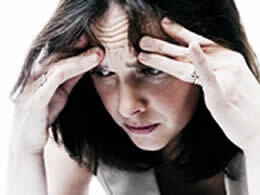 Panic attacks come on very quickly, symptoms usually peaking within 10 minutes. Most anxiety attacks last for between 5 and 20 minutes. Some people report attacks lasting for up to an hour, but they are likely to be experiencing one attack after another, or a high level of anxiety after the initial attack. You may have one or two anxiety attacks and never experience another. Or you may have attacks once a month or several times each week. For some people they seem to come without warning and strike at random. Anxiety attacks can also come in the night and wake you up. These nighttime attacks occur if your brain is on 'high alert' (due to anxiety) and can detect small changes in your body which it then interprets as a sign of danger. Night-time attacks may be particularly frightening, as you may feel confused and are helpless to do anything to spot them coming. What are the effects of anxiety attack? • Rapid breathing may make you feel light-headed and shaky, and give you pins and needles. • Rising blood pressure can make you more aware of a pounding heart. • Changes in the blood supply to your digestive system may cause nausea and sickness. • You may feel an urgent need to visit the toilet, and get 'butterflies' in your stomach. Anxiety can make you more fearful, alert, on edge, irritable, and unable to relax or concentrate. You may feel an overwhelming desire to seek there assurance of others, to be weepy and dependent. To cope with these feelings and sensations, you may feel tempted to start smoking or drinking too much, or misusing drugs. You may hold onto relationships that either encourage your anxious outlook or help you avoid situations you find distressing – and so stop you dealing with what’s worrying you. 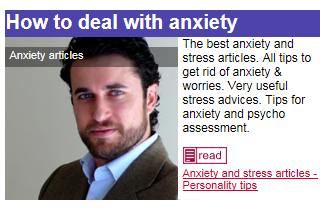 How to manage my anxiety attack myself? You may find that your symptoms can be controlled by breathing and relaxation techniques. Books and CDs on the topic are available both online and from bookstores to help you with this – also see Mind’s booklet How to manage stress for some exercises. Several self-help programmes on relaxation are available online, or you could attend a relaxation class. Being assertive means you can stand up for yourself while also respectinother people and their opinions. Learning how to handle difficult situations and to assert yourself can make you feel more confident and, therefore, more relaxed. Some people find that learning self-defense makes them feel safer. To find out about local classes, ask at your library or look on the internet. Some people may find that complementary therapies help them to relax, sleep better, and deal with the symptoms of anxiety. Yoga, meditation, aromatherapy, massage, reflexology, herbalism, Bach flower remedies, homeopathy, and hypnotherapy are some of the methods people have found helpful. Many chemists and health shops stock different remedies and may be able to offer advice. Exercise uses up the adrenalin and other hormones that are produced under stress, allowing muscles to relax. It can therefore help you to cope with anxiety and feelings of tension, and may help you sleep better. Walking and swimming allow you to be active at your own pace and you can do them alone or in company. 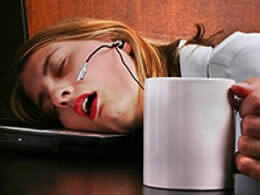 Eating a healthy diet and getting plenty of sleep can also make a big difference to your ability to cope with stress. Talking to a friend or family member about what's making you anxious can help. You may find that they have encountered a similar problem and can talk you through it; however, just having had someone listen to you and showing that they care, can help in itself. If you find that anxiety is affecting your ability to cope with everyday life and want help, your GP can help you find out what options are available. The most common forms of treatment offered are talking treatments and medication. You may also be offered, for example, exercise on prescription. Talking treatments (counseling and psychotherapy) can help you to understand and deal with the causes of your anxiety and to find strategies for coping. 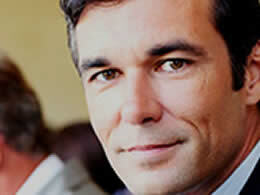 There are different types of counseling and psychotherapy available in groups or individually. Some types help with how you are feeling; others look into reasons why you may be experiencing anxiety; some may do both. Most services offer time-limited counseling or therapy –usually between 6-12 sessions, and usually one session a week. Some GP surgeries – and many voluntary organizations – offer a variety of counseling and psychotherapy services. NICE suggests that for particular kinds of anxiety, such as panic, socialphobia and obsessions, GPs should prescribe antidepressants, especially certain SSRIs (selective serotonin reuptake inhibitors). Antidepressants: SSRI antidepressants are usually better tolerated than some other drugs, but, in some cases, they may increase anxiety and can cause problems with sleeping. Your GP should give you the recommended dose for anxiety, and he or she should monitor your progress. If SSRIs don't work or aren't suitable, you may be offered a tricyclic antidepressant, such asimipramine or clomipramine. Beta-blockers: Doctors may also suggest beta-blockers to deal with symptoms such as palpitations, although the success of this treatment is variable. 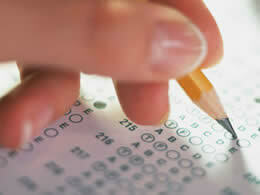 They may also help with anxiety in particular situations; for example, sitting an examor flying. Tranquillizers and sleeping pills: Doctors usually prescribe tranquillizers and sleeping pills (benzodiazepines) only as a temporary measure for severe or disabling anxiety, as some people become dependent on these drugs and have difficulty coming off them. They are given at the lowest possible dose, for the shortest possible time, and not longer than about four weeks. All these drugs may take several weeks to work, and may cause side effects, which your doctor should discuss with you. When you stop taking the drugs, you may experience withdrawal symptoms, such as dizziness, tingling, stomach upsets or headache. It is therefore important to reduce the dose slowly. How to help someone who is experiencing anxiety attack? It can be really difficult when someone you care about is experiencing anxiety attack, but there are things you can do to help. Try to think about how you feel when you are anxious about something yourself, and how you prefer people to help you – for example, by remaining calm and allowing some time for your anxiety to pass. Even though your friend or family member's situation might be different, this might help you better understand how they feel when they're going through a bad time. When someone you care about is experiencing a problem it's understandable to want to help them face their fear, or focus on leading them towards practical solutions. But it can be very distressing for someone to feel forced to face situations before they're ready – and it could even make them feel more anxious. By staying calm and listening to your friend or family member's wishes, you can support them to do what they feel comfortable with. Your friend or family member may already know how you can support them – for example by going through a breathing exercise together, or by calmly offering a distraction. By asking them what they need or how you can help, you can support them to feel more in control themselves. If your friend or family member’s anxiety is becoming a problem for them, you could encourage them to seek help. This could be support through a support group. Supporting someone else can be stressful, so it's important to remember that your health is important too, and make sure to look after yourself. Taking care of your own wellbeing can help you maintain the energy, time and distance you need to be able to help someone else.